The Aukey True Wireless Earbuds are a truly wireless listening experience. Allowing you to connect wirelessly up to 10m away - the instant and energy efficient way to stream your music without wires. Connect to two devices at the same time, so you can swap between your smartphone and computer with ease. Earbuds automatically turn on and pair. With up to 4 hours of playtime on a 2-hour charge and 6 charges in the charging case. Fully charge the wireless charging enabled case in just 2 hours. 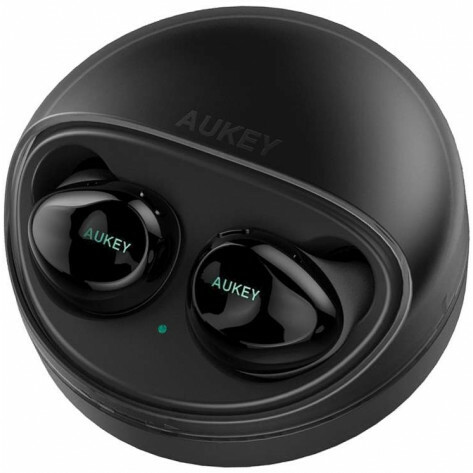 Manages calls and music playback through the multi-function buttons on the earbuds, with one touch activation for Siri or Google Assistant. The portable case ensures that you have a safe place to store your earbuds while they are charging. These secure fitting earbuds are truly wireless, built for the most rigorous of workouts and are IPX4 water resistant.